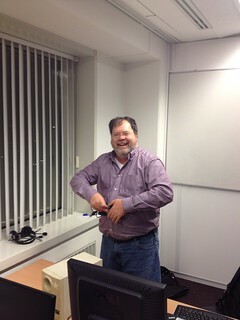 Last Friday I attended the first Dutch Powershell User Group meeting in Eindhoven at Master IT Training and it was great. There were a lot of knowledgeable and passionate people and the interactive sessions were great as well. Thanks go out to all attendees, but especially to the ones presenting and organizing the event. The fact that we were asked to leave the building (because it was getting pretty late and they wanted to lock up), also stresses the passion of all attendees because. If this wasn’t the case we probably would’ve stayed a lot longer. Be sure to check out the Dutch PowerShell User Group (DuPSUG) website and Twitter on a regular basis for articles and future events. Ed Wilson also wrote a post of the meeting on the “Hey, Scripting Guy! Blog”. Below are the sessions with some info about the speakers and their sessions. I also added notes I took and other information I looked up afterwards. If you come across any errors or have comments, please leave a reply so I can fix it.